1Genetics and Agricultural Biotechnology Institute of Tabarestan (GABIT), Sari Agricultural Sciences and Natural Resources University, Sari, Iran. 2Department of Agronomy and Plant Breeding, Sari Agricultural Sciences and Natural Resources University, P.O. Box 578, Sari, Iran. 3Department of Biology, University of Mazandaran, Babolsar, Iran. Rice as one of the most important agricultural crops has a putative potential for ensuring food security and addressing poverty in the world. 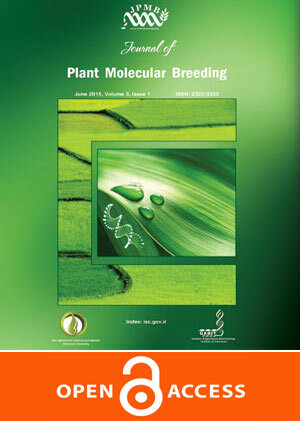 In the present study, in order to provide basic information to improve rice through breeding programs, Inter Simple Sequence Repeat marker (ISSR) was used For DNA fingerprinting and finding genetic relationships among 32 different cultivars. In this study, 12 out of 17 used primers amplified 184 distinct and reproducible fragments with high value of polymorphism (88%). also, for fingerprinting the cultivars 29 loci were used that generated high polymorphic bands among the cultivars. Results indicated that similarity index varied between 39% and 88.4 %, furthermore, PIC value with an average of 23% ranged between 0.1 (for primer #3) to 0.34 (for primer #2). Clustering based on Jaccard coefficient similarity index and UPGMA algorithm divided the cultivars into 6 main sub-clusters in cut-off point of 64% similarity index. The two Italian rice cultivars ‘Ribe’ and ‘Roma’ were the closest cultivars in addition, ‘Vialone nano’ and ‘Anbarbu’ showed the highest dissimilarity. In total, high genetic divergence was observed among the cultivars also, poly (GA)-containing 3-anchored primers amplified the highest number of bands. According to similarity and cluster analysis, it could be inferred that crosses involving Anbarbu cultivar are the most promising ones to improve rice through breeding programs. In fact, results of this study would be promising as a genetic marker for the identification of rice cultivars and an important source of knowledge for subsequent rice researches.